KCfirefighterscase | A Quest for Closure Outweighed the Search For Truth! A Quest for Closure Outweighed the Search For Truth! This site exists as a clearinghouse of information on the explosion that killed six Kansas City firefighters in November 1988. Many people remember the morning when shock waves shattered windows and woke people out of bed across the metro area. The case remains one of Kansas City’s strangest mysteries. What started as a routine call on a vehicle fire turned tragic when an unmarked construction trailer containing 25,000 pounds of ammonium-nitrite and fuel oil exploded while firefighters fought a second fire at a highway construction site. Across the street and up a hill from the vehicle fire, arsonists also set a company pickup truck and trailer on fire. A battalion chief and his driver and two private security guards witnessed the explosion. There was nothing they could do to save the firefighters. Approximately forty minutes later, after emergency responders evacuated the area, a second explosion of equal magnitude ripped through the site without causing injury. Read more about A Quest for Closure Outweighed the Search For Truth! Thirty years ago today, six Kansas City firefighters lost their lives in a tragedy that forever changed the community. Kansas City Deputy Fire Chief James Dean was a rookie firefighter that November night 30 years ago. A documentary filmmaker says he has found new evidence in the 1988 explosion that claimed the lives of six Kansas City, Missouri, firefighters. That incident happened 30 years ago -- Nov. 29, 1988. Since then, questions have remained. The huge blast of ammonium nitrate happened before dawn at a construction site near 71 Highway and 87th Street. The cause of the blast was ruled arson. Firefighters Thomas Fry, Gerald Halloran, Luther Hurd, James Kilventon Jr., Robert McKarnin and Micheal Oldham died answering the call. Filmmaker Joe O'Connor says new evidence points to a second, separate fire in the pickup truck of two security guards there that morning. KSHB KANSAS CITY, Mo. Nov. 29, 2018 — Thirty years ago, six Kansas City firefighters lost their lives in a tragedy that shook the metro area. Decades later, the community gathered to remember the men and the day they took their last call. On Thursday, Jacqueline Oldham tried to remember her father, Michael Oldham, as others honored his sacrifice. On Nov. 29, 1988, Oldham was 3 years old. "Every year we remember this date, and it's nice that the rest of the city shares with that," she said. 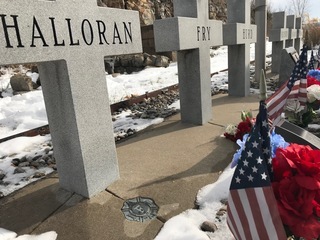 On Thursday, the 30th anniversary of an explosion that killed six Kansas City firefighters, members of the Kansas City Fire Department gathered at the site of a memorial built to remember the loss of life. Thousands of Kansas Citians vividly remember that house-shaking, window-rattling moment. Jolted from their 4 a.m. sleep by a thunderous explosion that could be heard and felt dozens of miles away, the community soon learned about the calamity. On Nov. 29, 1988, the Kansas City Fire Department crews of Pumper 30 and Pumper 41 were dispatched to put out a fire at a construction site near 87th Street and what is now Bruce R. Watkins Drive. That’s when a burning trailer containing thousands of pounds of ammonium nitrate exploded. The firefighters died instantly. NOTE: In accordance with Title 17 U.S.C. section 107, this material is distributed without profit or payment to those who have expressed a prior interest in receiving this information for non-profit research and educational purposes only.